The goal of Bits & Bytes is for each player to guide their character (program) to their home by issuing instructions (turn right, turn left, move forward, turn around). At the same time they have to avoid walls, bugs and the dreaded Seepeeu (pronounced CPU). Sounds simple, right? But that’s the point. 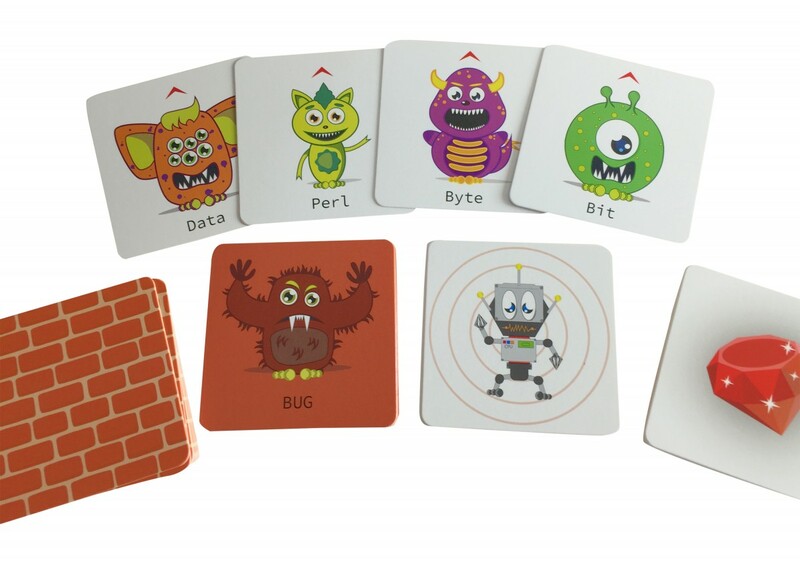 Children are playing a card game, but at the same time they are creating computer concepts, like algorithms and the sequencing of instructions, and they are learning the invaluable skill of problem solving. And by doing so they are developing a logical mind-set, which is required for coding/programming. By playing Bits & Bytes, children are developing the logical foundations for programming computers, thus when they start to learn actual coding later in life they already have the required mindset. After all, actual coding (programming) is little more than issuing a few instructions to a computer. The game is over when all players have got their Program back to the planet Ram (their home) in the middle. 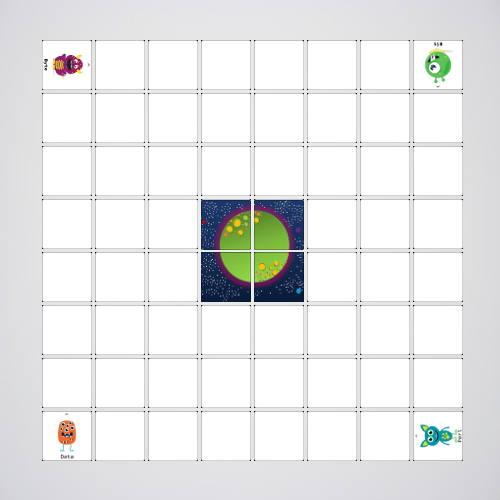 As well, the game can be made easier or more complicated (for example, the grid can be 6×6 to make it easier, or you can merge two decks of cards together making the grid larger and the game harder), players can change the impact of the Bug cards and much more. The only limitation is your child’s imagination. But Bits & Bytes provides much more… The back story of the game explains how computers actually work, the font used is commonly found in coding environments, the character names are computer terms. Everything about the game has been designed to make children comfortable with and prepared for coding. Being a card game Bits & Bytes is incredibly flexible. The default grid (layout of the cards) is 8 x 8, however to make the game easier (or quicker) the grid could be 6 x 6. Once a child has mastered the game it can become more difficult by combining multiple decks together to make the grid larger (i.e. 12 x 12 or 16 x 16). Or they can plan and lay out their program’s steps (instructions) in advance and then move their program through each step. If they encounter a bug they need to debug their instructions and then re-run their program to see if it works – just like actual programmers! 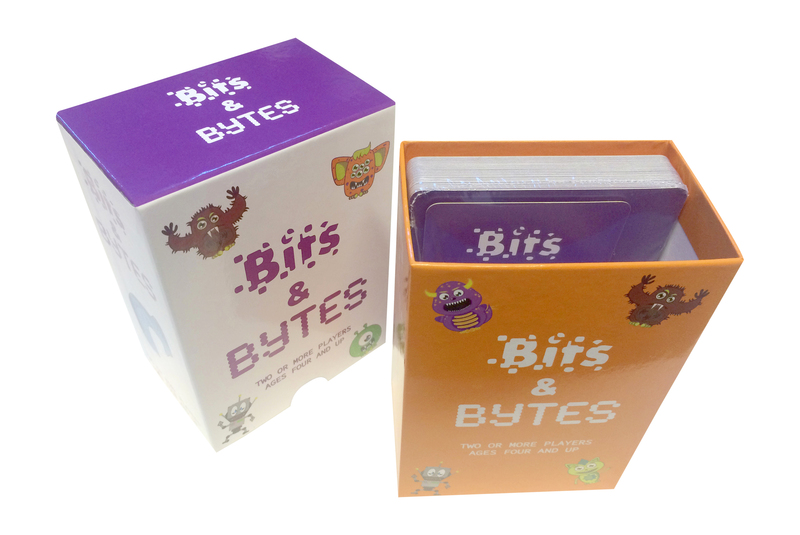 Bits & Bytes is an intuitive, fun game with vibrant characters that appeal to children of all ages. If you would like to buy a copy of Bits & Bytes then you can buy it now from Amazon. I am wondering if a game like this would be good for my nephew? He is 8 and he’s been diagnosed with HFA (high functioning autism). Hi Jonathan. One of our supporters is a special needs teacher in secondary school and her feedback is that it is ideal for children with special needs. We haven’t tested specifically on children with HFA but would welcome the feedback if you were to.